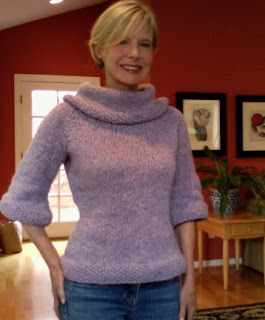 This is a simple sweater, knit from the top-down with chunky yarn so it goes fast. Details are the bell shaped sleeves, seed stitch borders and large cowl. This is a particular favorite of my husband who loves the Audrey Hepburn look. Frances Revisited is a free Ravely download. The yarn is RYC Soft Tweed in Thistle. This was a nice break from some of the more complicated patterns and tiny-needle projects I have in my work basket right now. I love the break that top-down, heavier-weight sweaters provide from more complicated knitting too :-) And yours turned out so well as always. That shade is lovely on you! Cute sweater! And it looks great on you. Don't you love the RYC Soft Tweed? Very soothing to knit. This sweater looks so pretty in person! I love the color & the waist shaping!